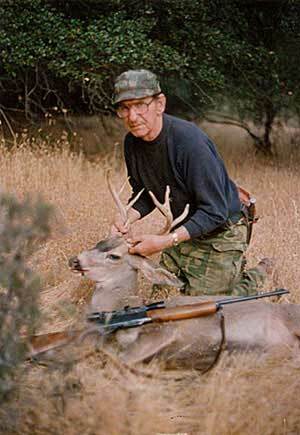 Father's Day always makes me think about the person who taught me to be a hunter. Not only did my father teach me how to hunt, he also gave me memories for a lifetime. This story was written by my brother and published first in California Hunter Magazine in 1993. With Father's Day just around the corner, I wanted to share it again. Age may have slowed him down but our dad's shot was still true. Here he is with his last buck, a beautiful tulip-racked blacktail. I was hoping for next year, yet I knew deep down inside this would be his last hunt. Time was failing him fast. I knew this, for the hunt had become more important to me than it was for him. He, the hunter who years earlier had coaxed the sleepy little boy from his warm bed into the chill morning of opening day, was silently leaving. He had instilled in me the respect and joy of all things wild and now he was silently slipping away. He was coming to the end of the full circle  the hoop that life is. I see now that I was grasping at the rope of time, trying hard to pull it back to a more comfortable place. A struggle that leaves you tired and trembling and devoid of energy  save for the thinking of it, and rethinking of it that forges memories into the blue-steel history of family that links father to son, to grandson, and beyond. unspoken like mortar that binds the bricks of our memories together. Trying to drive into the past, I slowly pulled the truck into the trees and turned off the key. We slept, side by side in the back of the truck, covered by the canvas tarp and with the thick foam pad comforting us from below. The sleep of a thousand years, too soon broken long before daylight. I now was coaxing my young son from his warm bed. There we were, the three of us, each blowing the steam from the top of his coffee cup. The grandson drinking his first cup of camp coffee, the grandfather drinking his last. And later, as we did drives and still hunts and walked in the thin mountain air until I thought I would drop, he continued slowly on, uncomplaining, though his tired, aged joints must have been talking to him as he pushed up the hills. He said nothing and I admired him for his inner strength. And though I couldnt put even the smallest buck in front of him  as always, never even the slightest complaint. Hard days of hunting to no avail. The grandson enjoying the companionship of the old hunter, the grandfather slowly bending before the work of the hunt, and me desperately trying to hold onto the past and weakly having to accept the present. The camp was quietly packed into the back of the truck. The drive home seemed so long. Like the slow, droning ride from the funeral of a loved one. Quiet, contemplative, somehow defeated, yet no one speaking of it. Light conversation, avoiding talk of little success, but facing the frailty of the old hunter. I pulled the rope again. Could he do it? Could he still hit the mark? Just knowing that he could still make the bulls eye might be enough to slow time for me. Pulling off the road onto a log deck, I set out an old oilcan at a hundred yards. Once, twice, three times I saw dust fly around the can. No, I thought, this just cant be! It must be the scope, so I shot the gun. As the can tipped over, my heart sank. The gun shot true! Nothing was said as I walked up the hill to retrieve the target. Bending to pick up the can, I was shocked. Tight together in the middle were three round holes  a quarter could have covered them all. And there was my shot, high and to the right  out of the center just enough to topple the can. Refreshed, I ran down the hill, slapped him on the back and we headed for home. I smiled as I thought, he could still do it as always he could still hit the mark. I comforted as I talked of his always-true eye. And the boy added that grandpa may be slow, but he still was deadly! Oh, how we wished for one more chance; for one more hunt. "Keep your rifle up front," I told him. "There still might be a buck around the ranch, you never know. Maybe well see one on the way up the drive." The gravel past the gate crunched beneath the tires as my eyes quickly searched the field in the growing dusk. Was that one? I pulled the truck to a stop in front of the house and leaped out to look again. No such luck, I thought. Now, in the dying light, I realized it was the old stump we had used for target practice many times  no such luck! In turning back to the truck, my mind suddenly seemed jumbled. "What was wrong?" I thought. The confusion of rapid, unexpected change in emotion finally cleared. I realized that forty yards beyond the stump, to the left in the edge of the tree line, stood a deer  a buck, a beautiful heaven-sent three-point blacktail buck. He stood feeding, not even appearing to notice our arrival. Fairly running in panic, I raced to the truck where the grandfather and grandson were still sitting. "Theres a deer in the field", I spat out. "Theres a deer in the field?" he half questioned. "A deer, a buck!" I whispered, as I half-pulled him from the truck. Over by some trees I ran, looking back in horror to see him slowly, unhurriedly walking toward me in that straight-forward, matter-of-fact way he always handled himself when things got a bit dicey. "By the trees," I whispered. "I dont see him," he whispered back. "By the woods," I spoke in panic, the buck turning to look at the commotion and slowly turning away to feed again. "Oh!" he said, "by the woods!" For him, in the growing dark, the "trees" were the few oaks that grew in the field and the "woods" were the thick growth that bordered the edge of the field. Through the scope he looked, seconds seemed to drag on as the buck quartered hard away. "Behind the ribs," I whispered. "Shoot behind the ribs!" The angle was hard. Would he find him in the scope? One hop and the woods would swallow him. "Shoot, Pop. Please shoot!" the response learned years earlier when trying to survive while other men had shot at him while he had served his country.
" I was stopped as the rifle rocked him back. The buck reared up on his back legs and jumped, his front legs straight skyward, only to collapse as he came down. The buck regained his feet for a final jump sideways, and then was silent. The bullet had entered in front of his right side and had taken the top of his heart away. A difficult shot, taken flawlessly! Slowly Pop rose from his rest, turned and handed me his rifle. He quietly stepped around me, needing to say nothing and I knew that the course of things, as whenever my father had a hand in them, would be natural and acceptable  my doubts were unnecessary. I silently watched him walk away. My father was never to pick up the rifle again. It was his last hunt. The tulip-shaped 3-point rack on this buck was the last one to get his tag. It was the last time I doubted my fathers fate or for that matter, my own. This was lifes hardest, yet ultimate lesson. And yet the memories flood your soul until they roll slowly off the edge of your cheek to drip gently back to your heart where they are saved for the next quiet, unspoken thought.